When Ramblin' Root Beer came out, it was puzzling - did the world really need another root beer? There was already Hire's, A&W, Mug, Dad's, Barq's, Shasta, Faygo, Nesbitt's and various store brand knock-offs. So what made Ramblin' any different? Well,......nothing actually. I swear it was just Dad's root beer in a different can. Ramblin' was discontinued in the '90s when the Coca-Cola company, which made both Ramblin' and Dad's bought the Barq's root beer company. 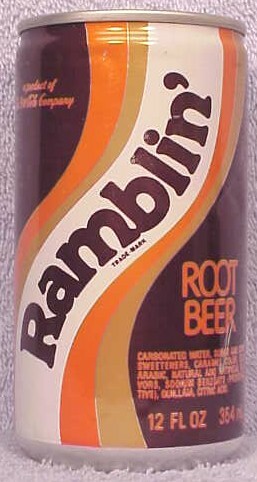 I do remember when Ramblin' Root Beer was introduced - circa 1980-1981, when I was in high school and working as a bagger/cart jockey in a grocery store. Ramblin Root Beer is back now!!!! Made with real sugar and in a glass bottle!!! now available through Real Soda in Real Bottles !! I remember Ramblin Root Beer. It was one of my favorites as a little kid back in the 1980's. Sure miss having it. Its also available at therootbeerstore.com along with the butterscotch root beer version and the maple root beer version.